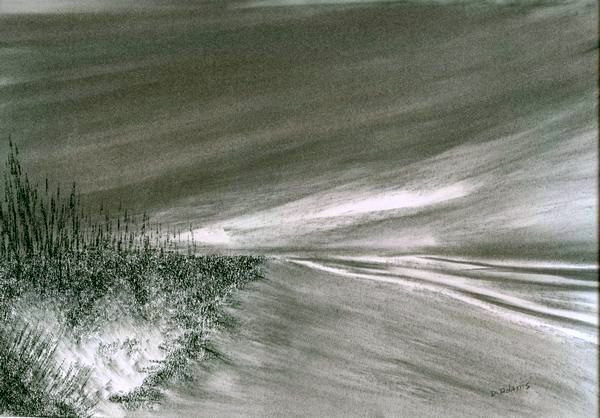 Charcoal drawing of the Cape Hatteras Shoreline in North Carolina of the United States. Also known as the Outer Banks ( OBX). Outer Banks is my home away from home during the summertime. I can also pull my 4wheel drive right up to the shoreline and set up my things right by my truck. The shoreline is more than 70 miles long, and is a site to behold. The peace and tranquility make me feel like a new person each morning that I arrive at the beach. I enjoy to walk along this great beauty each morning to get my morning exercise, and find a shell or two along the way, then sit back, relax and read a good book. I used swift, smooth strokes moving in the direction I wanted the clouds. Same with the sand and water, then I lift some color out of the water to give the illusion of waves. 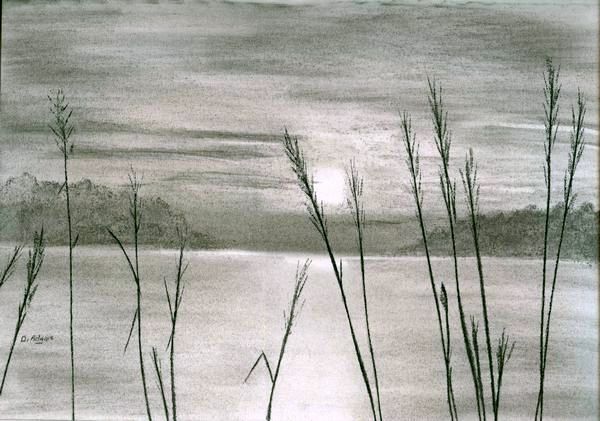 I used compressed charcoal for the the landscape foliage by blotting, and using quick short strokes. Most often referred to as Ocracoke ponies, Banker horses have been documented on Ocracoke since the 1730s, although many believe and some evidence supports the popular belief that the horses arrived much earlier with Spanish explorers during the 16th century. Throughout Ocracoke history these small, but sturdy horses have served the residents, the U.S. Lifesaving Service and the U.S. Coast Guard, and their descendents continue to capture the attention of visitors to the island. 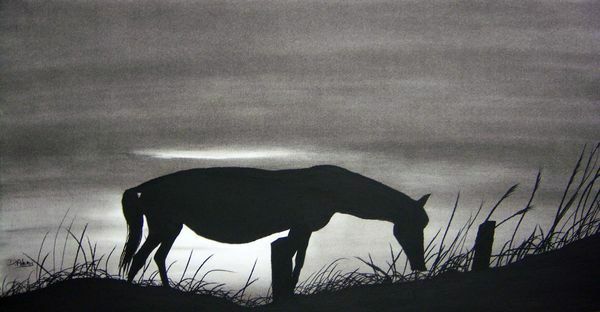 In the past, the number of wild horses on Ocracoke reached as many as 300. During the late 1950s, Ocracoke Boy Scouts took care of the horses, having the nation’s only mounted troop. In 1957, when the highway was built, the horses were moved to pens to protect them from injury due to increased traffic and to preserve the small island’s natural resources. In the early 1960s the care of the horses was designated to the National Park Service. Today, the aging Ocracoke herd is no longer wild, by any stretch of the imagination. The horses are fed twice a day and receive veterinary care. The population of the herd has dwindled to 17 horses due to natural causes and two stallions have been borrowed from Shackleford Banks to try to increase the number of horses. If you are visiting Ocracoke Island, do stop by the Pony Pen to pay a visit to these deserving descendants of the Outer Banks icons of the past, although do not expect to see horses that appear to running free and wild. On most days, you will be able to see at least a few horses from the National Park Service viewing platform, which is located on the sound side of Route 12 between Ocracoke Village and the Cape Hatteras Ferry. Pamlico Sound sets right behind the site where our camper is parked. It’s a lovely view. Charcoal pencils for the sea oat, vine and willow charcoal for the rest of the scene.